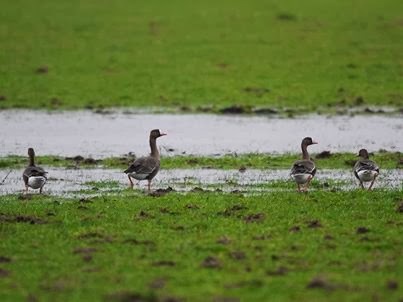 Four White-fronted Geese found at Cayton Car were the highlights of the day, a Little Egret was also seen there. At B&Q the 9 Waxwings were still present, 63 Teal, 6 Tufted Duck and 13 Redshank were on Johnson's Marsh and the Great Northern Diver and 26 Purple Sandpiper were in the Harbour, 22 Whooper Swans were just north of Flotmanby Carr, 3 Dunlin were still on Folkton Carr, and 2 Great Crested Grebe, 9 Pochard and 2 Goldeneye were on Wykeham South Lake. On the move (south unless stated) were 1 Red-throated Diver + 5 north, 11 Fulmar + 3 north, 13 Gannet, 8 Cormorant, 8 Greylag Goose, 2 Teal, 2 Mallard, 1 Shoveler, 1 Eider north, 3 Common Scoter, 1 Knot, 1 Bar-tailed Godwit, 1 Mediterranean Gull, 36 Black-headed Gull, 38 Common Gull + 1 north, 693 Herring Gull, 42 Great Black-backed Gull, 7 Guillemot and 1 Razorbill.